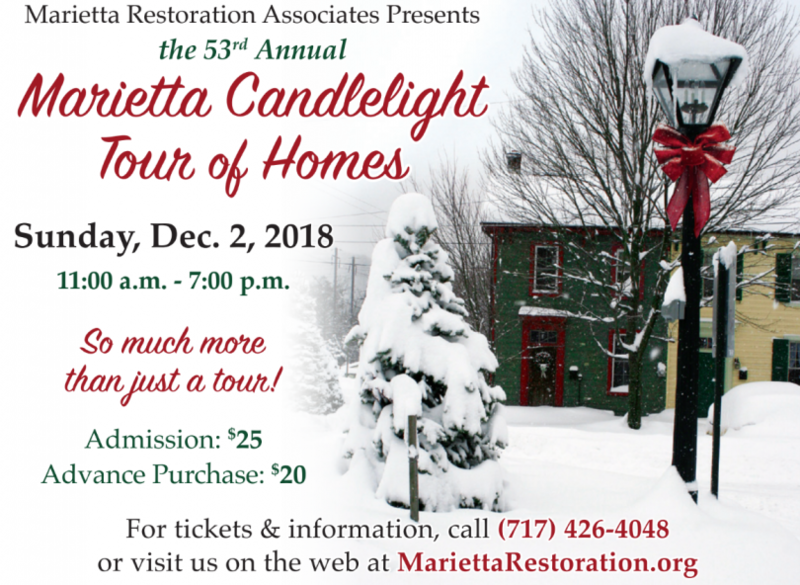 Marietta Restoration Associates are proud to host one of the oldest, continuous holiday walking tours in Pennsylvania. A splendid array of 8 – 10 private homes, public buildings and a variety of special events make this a tour you will not want to miss. Funds generated by the tour are utilized in the maintenance, restoration and preservation of Old Town Hall, Union Meeting House, the Bank Building, restoration of the Historic Marietta Theatre project, and Musselman/Vesta Office Building. Free parking and convenient shuttle bus service is available. Advance tickets are available at a reduced rate prior to the tour, and may also be purchased on the day of the tour. For ticket information/availability, please call 717-426-4048 or visit www.mariettarestoration.org.